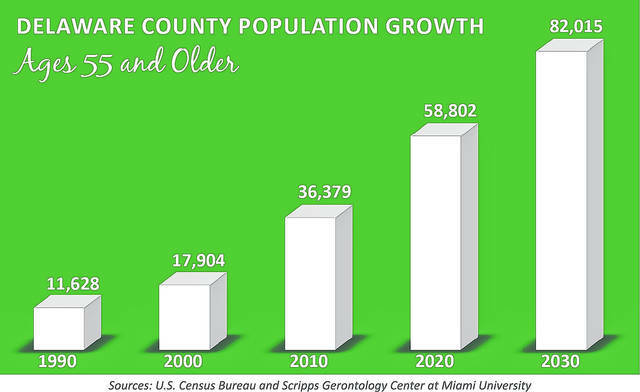 Pictured is a population growth chart for Delaware County residents ages 55 and older. Seventeen local and state organizations and agencies came to SourcePoint in early February to learn more about the international effort led locally by SourcePoint in collaboration with the Delaware General Health District. The purpose of the initiative is to help cities and communities prepare for two global demographic trends — the rapid aging of populations and increasing urbanization, according to Fara Waugh, director of client services at SourcePoint. Late last year, the Delaware County Commissioners passed a resolution to join the network of age-friendly cities and communities by encouraging active, healthy aging to improve the quality of life of the county’s older residents. Age-friendly or livable communities have walkable streets, housing and transportation options, access to key services, and opportunities for residents of all ages to participate in community activities. The Age-Friendly Project, an initiative of the World Health Organization and spearheaded by AARP in America, will take five years to complete. The process begins with an extensive assessment administered by the health district starting in May, in which the community’s assessment of Delaware County’s strengths and weaknesses are identified in relation to eight domains of a livable community as identified by the World Health Organization. The domains include outdoor spaces and buildings, transportation, housing, social participation, respect and social inclusion, civic participation and employment, communication and information, and community support and health services. For more information about the Age-Friendly Project in Delaware County, contact Amelia Tucciarone, quality improvement supervisor at SourcePoint, at amelia@MySourcePoint.org or 740-203-2392.
https://www.delgazette.com/wp-content/uploads/sites/40/2018/02/web1_County.jpgPictured is a population growth chart for Delaware County residents ages 55 and older.